When I buy carrots at Costco, I choose the whole unpeeled, organic ones. I’m not really into the big “organic” craze, but I stopped buying the “baby” carrots a few years back after hearing and reading claims that the carrots have been soaked in chlorine. Now whether or not you believe this, (here is an interesting article by snopes.com: http://www.snopes.com/food/tainted/carrots.asp) what I do know, is that the whole carrots simply taste a lot better then the small pre-cut cocktail sized ones! After taking the time to peel and cut them, you’ll notice they don’t turn white when stored in the refrigerator like the little knobby ones do. In fact, I have noticed the fresh ones can even turn your fingers or the inside of the storage baggie a bright natural orange! Carrots are great food to cook with. They’re cheap, healthy, colorful and flavorful. I also cook a lot of carrots because Bill loves them and the packages I buy them are 10 pounds! (don’t clean and peel all of them until you’re ready to use, other than some for snacking and munching and if you store them in the fridge, they last for a couple of weeks without becoming soft!) Carrots are naturally sweet, so just a touch of extra sugar or sweetener turns this easy carrot dish into a real treat! And, with just a few ingredients, it’s a breeze to prepare. You choose what makes your dish sweet! You can use dark Agave, which is a popular sweetener commercially produced from several species of agave and found in the syrup area of your local grocery store, use pure maple syrup, or brown sugar. This is really a “dump” of a bit of this and a bit of that type of side dish and the amounts depend on the amount of servings you wish to prepare. I assembled this recipe so you would have a basic idea of how much of each of the few ingredients are necessary! It’s simple! Peel the carrots, and cut into diagonal slices. To par-cook them, I place them into a heavy quart sized freezer bag. Rinse, and then shake out any access water. Zip the bag almost closed, leaving enough room for steam to escape! Microwave for two minutes on high. Mean while, while carrots are cooking, heat the butter in a skillet over medium heat until melted. If using sugar, stir it in and mix constantly until sugar is dissolved and mixture is bubbly. 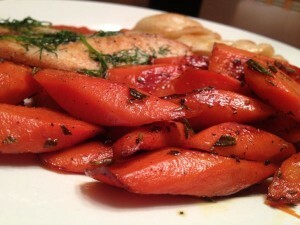 Add cooked chopped carrots and toss in the syrup and rosemary. Continue to cook and toss as the carrots brown, but be careful not to overcook or the mixture or it will taste scorched. Remove the skillet from the heat and season with salt & pepper. We enjoy these along side of many dishes. 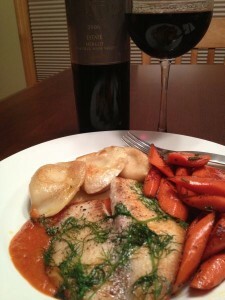 This day it was pan seared Tilapia with dill in a squash pasta sauce and store bought Potato Pierogies that I also picked up at Costco as well as one of Mitch Cosentino‘s delightful Merlot’s! Quick, easy, healthy and delicious! Sounds great! When I get a bag of carrots, I usually make a carrot souffle or a spicy version in a sauce pan with butter, cayenne and lemon juice. Can’t wait to try this recipe! Pleased to see your carrot recipe here – one of my new favorite vegetables. Carrots grown in a cooler climate are naturally sweeter, so it shouldn’t surprise you that I buy an over surplus at our farmers’ market towards the end of the growing season here in Anchorage. I’ve been advised by these ‘farmers’ to wrap each carrot individually in a paper towel and then insert into a sealed baggie, refrigerate (or place in a dark, cool cellar) and they’ll keep for months. It’s true!! Just wanted to share that bit of knowledge. Thanks Jean for the suggestions on storage! We value your feedback! I’ll keep that in mind and stay warm this winter in Anchorage! Cheers!